Surface Test Inks are primarily used to measure the surface energy of non-porous materials such as plastics, metal and glass surfaces in dynes/cm ( mN/m ) prior to printing, coating or adhesion. 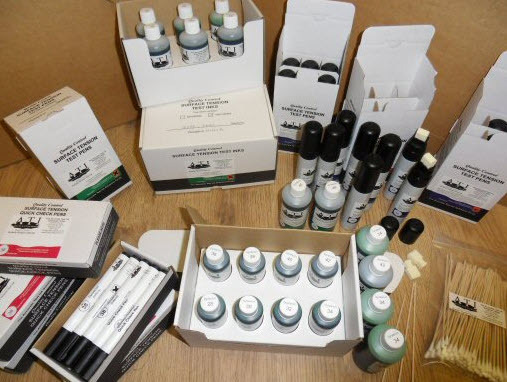 Predominantly used in the Corona Treatment and Plasma Treatment processes of surface pre-treatment, promoting adhesion, to determine the cleanliness and the surface energy of substrates in the packaging sector, our Surface Test Inks can additionally be utilised in industries such as automotive engineering, aviation engineering, medical technology and electronics manufacturing. Surface tension is an essential point for adhesion in printing, sticking process on plastic, metallic, and generally all non porous materials. 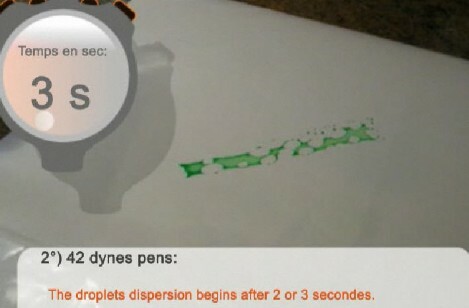 The control test pens and inks allow an accurate and quick determination of surface tension in dyne/cm (mN/m). Avoid the contact with eyes, and skin (toxic, dangerous). Non-toxic ASTM D-2578 compatible test inks. 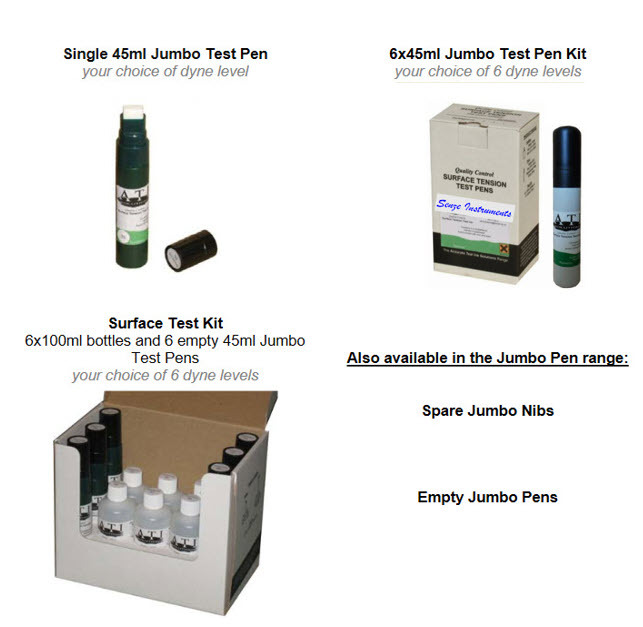 Our Jumbo Test Pens use a 15mm nib that clearly displays test results, the nib can be changed if you suspect contamination from sources such high slip materials. 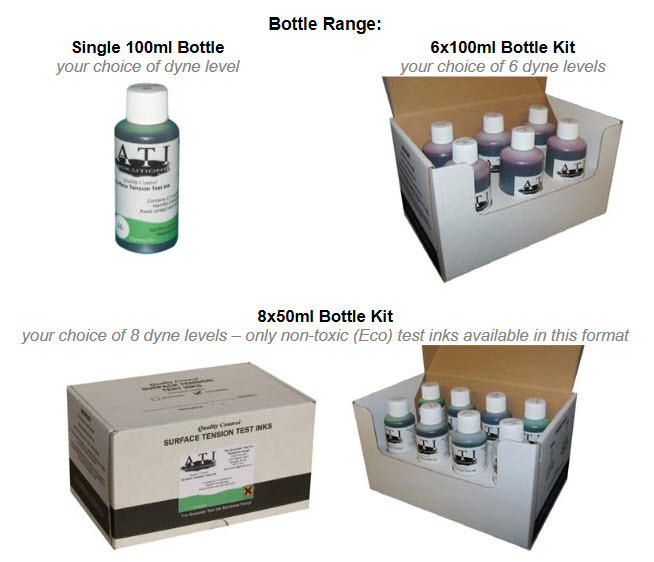 Finally our Jumbo Test Pens use a valve system to prevent contamination of the dyne test ink. Test pens are sold by box of 6 items (45 mL of ink in each pen). The Test pens are designed with reservoir and released valves. 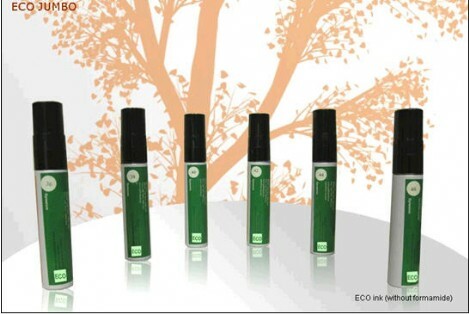 The test pens are available prefilled or empty. These systems allow to use virgin ink on demand. • Daily opening: 3 months storage. • Weekly opening: 6 months storage. • Monthly opening: 12 months storage. 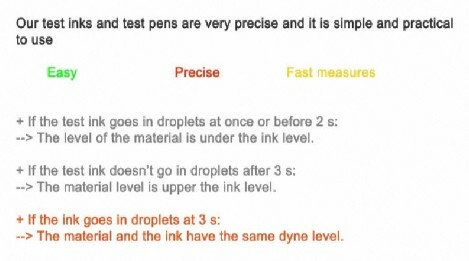 - To avoid inaccurate reading of the dynes level, do not store the pencils test ink at a temperature above 20 ° C or below 10 ° C.
- Take care not to pollute the tip of the pen, for example, by applications too frequent on materials containing a lot of slip agents.